The IDC’s Research and Information Department has released the “Performance of the primary and secondary sectors of the South African economy – statistical update” report. 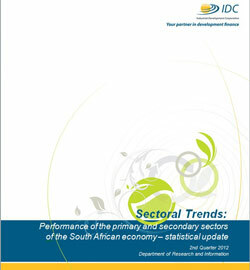 Sectoral Trends: Performance of the primary and secondary sectors of the South African economy – statistical update. The real value added by the agricultural, forestry and fishing sector contracted by 0.4% in 2011, compared to 2010, whilst the mining sector’s volume of production declined by 0.6% over the same period. In contrast, the volume of production in the manufacturing sector increased by 2.5% in 2011. With fixed investment in manufacturing increasing by over 10% in real terms in 2011, the utilisation of production capacity in the overall sector stood at 80.6% in the final quarter of the year – that is, a relatively low level which is also associated with continued weak economic conditions. On the employment front, the agricultural sector recorded 3 000 job gains, or 0.5% growth in its employment, over the closing quarter of 2011, compared to the corresponding period a year earlier. Mining sector employment, in turn, expanded by 2.8%. The manufacturing sector reported about 6 000 job losses (or -0.5%) year-on-year in the fourth quarter of 2011. South Africa’s total exports to the rest of the world grew by 19.2% to R691.5 billion in 2011, with exports destined for China, Japan, the United States and other African markets making up the largest contributions to this growth performance. The top export categories included precious stones and metals (mainly platinum, gold and, to a much lesser extent, diamonds), ores slag and ash (largely iron ore and, to a much lesser extent, chrome and manganese), mineral fuels (mostly coal and refined petroleum), iron and steel products, as well as vehicles, parts and accessories. Imports into South Africa from the rest of the world grew by 23.9% to R726.2 billion in 2011, with this growth associated mainly with imports from China, the United States, Germany and Saudi Arabia. The top import categories included mineral fuels (largely crude oil and refined petroleum), machinery and equipment (mostly computers, printing equipment, heavy equipment and steam turbines), electrical machinery and electronic equipment, as well as vehicles, parts and accessories.